FURNITURE from Inveralmond Community High School is on its way to the Caribbean where it will be used by youngsters whose lives were devastated by hurricanes. West Lothian Council and the Surplus Educational Supplies Foundation charity joined forces to collect unused desks, chairs, black and whiteboards and other types of classroom equipment, which would normally have been scrapped after recent refurbishment work at the school. A 40-foot freight container was picked up last week from the school and will be shipped to Grenada. David Miles-Hanschell, founder of the Surplus Educational Supplies Foundation, explained: “I was born and brought up in Barbados in the West Indies. “When I heard of the destruction of the neighbouring island of Grenada I felt compelled to do something to help. “With school closures, new builds and the continuous renewing of resources in Scottish schools I wanted to recycle these textbooks, furniture, computers and help those less fortunate. 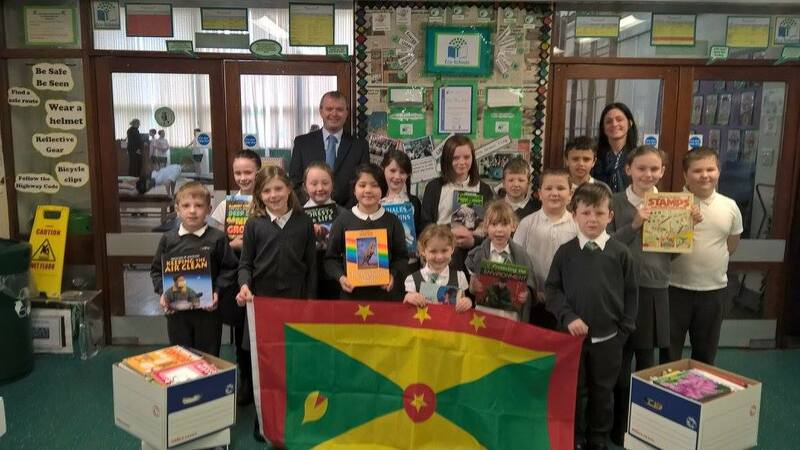 “I am incredibly grateful to West Lothian Council for donating the equipment to my foundation which will be very much appreciated by the children in Grenada. “The project at Inveralmond was very much a team effort and would not have been possible without the help of Interserve Projects Ltd, in particular Site Manager Gerry McTiernan and his team, who helped load the freight container with equipment. Executive councillor for education, Andrew Miller, added: “When Mr Miles-Hanschell asked if we would be able to donated the unused equipment we were delighted to help, it’s a fantastic cause which will go a long way to assisting children in areas with high levels of poverty. “The new facilities at Inveralmond will be superb but it is heartening to know that the old equipment is going to a worthwhile cause. IN TRANSIT: David Mr Miles-Hanschell, depute head Mr McGhee, project manager Fiona Coutts, head teacher Bill Tevendale and Gerry McTiernan get the freight container prepared for its long trip.